Home >:: Area Rugs >:: Solid Area Rugs >:: Kramer Area Rug, 5' x 7'6"
Add the Kramer Area Rug, 5' x 7'6"
Kramer Area Rug, 5' x 7'6" The perfect floor decor for fans of comfort and versatile style, this Kramer 5' x 7'6" area rug offers a solid tone and lush pile. The perfect floor decor for fans of comfort and versatile style, this Kramer 5' x 7'6" area rug offers a solid tone and lush pile. Love this rug. A little pricier than I would usually consider for an area rug but it is so worth it. It is so comfy and soft on my feet. I wear slippers around my house all the time but make sure to stop and take them off when I'm going to be walking on the rug so I can feel the softness. Would recommend and buy again. I love this rug. This area rug is extremely comfortable and soft, which our dog really appreciates. It also fits great in our living room. Really great. It is very fluffy, great on your feet. This is the most soft and fluffy rug I have ever owned! Super soft and great feeling on your bare feet! I absolutely love it....It is so soft and looks very stylish. I make people take their shoes off just to feel it on their feet! This sectional is very comfortable. If you like lots of pillows this is the couch for you. Cindy, thank you for your review and for choosing Raymour & Flanigan. 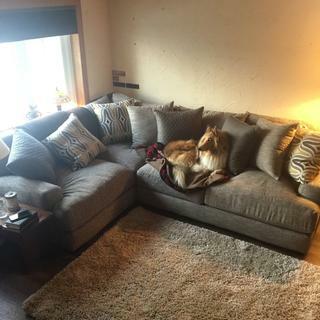 We are so glad to see that you (and your beautiful fur baby) are enjoying your new furniture! Can I have it professionally steam cleaned? BEST ANSWER: I would recommend getting a professional cleaner to do the cleaning and have them use the best technique. You can also call Customer care at 866-383-4484 option 7 for assistance. Best of luck. 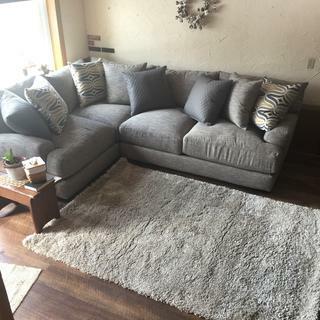 What colors does this rug come in? BEST ANSWER: The Kramer rug is available in only the color as shown.